Today I am a guest stamper on Stampin' Pretty! It's always on honor for me when Mary Fish, who is also my up-line, posts a project of mine. I chose to do a Christmas card for today, since the holidays are fast approaching. I started with Whisper White card base that measures 5-1/4" x 5-1/4". I took a 5' x 5" piece of Cherry Cobbler CS and cut on the diagonal and then cut each of those pieces in half. Cut a 4-3/4" x 4-3/4" of the gorgeous new Snow Festival DSP from the Holiday Catalog in the same manner as the Cherry Cobbler CS and layered them together. 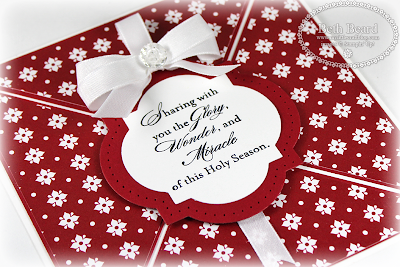 The sentiment is from the More Merry Messages stamp set and cut it out using the New Window Frame Framelit Dies. Paper piercing was a snap with the New Festive Paper Piercing Pack, Pierce Mat & Paper-Piercing Tool. And finished it off with some Whisper White Taffeta Ribbon and a Vintage Faceted Button. If you would like to watch the video on how I tie a double bow, please click here. Ink: StazOnTools: Window Frame Framelit Dies, Big Shot, Festive Paper Piercing Pack, Pierce Mat & Paper-Piercing Tool. This card is so very elegant and simply breathtaking! Love the design. Beautiful card Beth!! I love the classy look of using just two colors. Have a great time at the air show. Gorgeous....I didn't get this paper, but I am rethinking it after seeing this! Beth, as Mary indicated, you are the stamper to watch.... Just love your cards and this one is no exception! Stunning! I particularly love what I perceive is a ribbon cross. So symbolic. Congrats on a great " Mary Sunday feature item". I really like this card Beth - I think this would be a great birthday card too with some bright paper! This card is so pretty. As Katy said, I just love your cards. The triangles are such a great idea to feature that DSP!